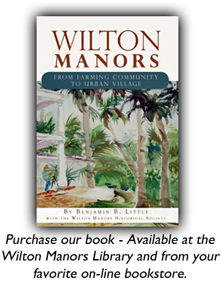 Thank you for your interest in supporting the Wilton Manors Historical Society. You may do this by either becoming a member or renewing your membership, or by making a donation to our effort to restore and re-purpose the Willingham Carriage House. You may make your payment either by check or online with PayPal. Please see below. Our dues are $25.00 per calendar year, whether you are an individual, household, business or organization. If you would like to pay by check, please download and complete our MEMBER/Donor Information Form, and follow the included instructions. Name (s):* A value is required. Zip:* A value is required. Email (s):* A value is required.Invalid format. This information is used to contact you regarding the activities and mission of WMHS, and will not be shared or sold for commercial purposes. Next, fill-in the box below as instructed. Then, click the button below that. Your application will be submitted and you will be taken to PayPal to pay for your membership. The Historical Society is an IRS 501(c)(3) approved tax exempt not-for-profit corporation. A COPY OF THE HISTORICAL SOCIETY’S OFFICIAL REGISTRATION (CH41711) AND FINANCIAL INFORMATION MAY BE OBTAINED FROM THE DIVISION OF CONSUMER SERVICES BY CALLING TOLL FREE (800-435-7352) WITHIN THE STATE. REGISTRATION DOES NOT IMPLY ENDORSEMENT, APPROVAL, OR RECOMMENDATION BY THE STATE.